"100 Profit Pulling Kit Gives Everyone The Power To Create Niche Websites"
As you can see, with the scripts included inside Scripts2Sell, you can make a Payment Processor website like PayPal, an auction website like Ebay, a Random Payout System Member website like WebStars or DollarRain, a Paid 2 Read Email website, a Dating or Personals website, a full blown online store, your very own Webring, a Subscription website, a Pay-Per-Click website, a Portal or Directory website like Yahoo!®, or even create your own Blog-For-Profit website, plus others I haven't even mentioned! And if all that simply isn't enough to convince you, I'll even give you a Risk-Free 30 Day 100 Money Back Guarantee with your purchase. That gives you 30 days to use it, test it, and sell it. If Scripts2Sell isn't everything that I say it is by all means, get your money back for your purchase. But I know you will see the value hidden within Scripts2Sell and love it just as much as I do! So let's quickly re-examine everything in this One-of-a-Kind offer. You get 35 outstanding scripts to create niche websites with, all downloadable from one small master ebook, a copy of this very salespage you can customize for easier reselling, along with a pre-built "thank you" page to direct your customers to after their successful purchase which you keep 100 of all profits from, Lifetime Upgrades to Scripts2Sell, and of course Full Resale Rights to the entire package with your purchase. *new 2017!! 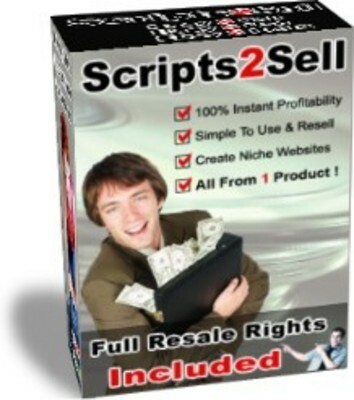 Resale Rights Scripts To Sell!